In addition to being a handy tool when doing maintenance/repair/upgrade projects in dark places on the RV, this trouble light is great for helping to keep your water bay from freezing in the winter. Plug the light in, install a 60-100W bulb (like these heavy-duty 60W bulbs), turn it on and put it in your water bay. VOILA! Easy, continuous low heat that keeps everything thawed! 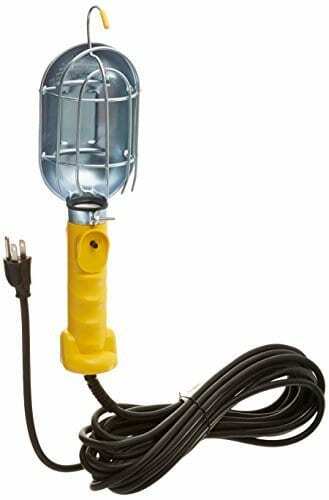 Bayco SL-425 Metal Shield Incandescent Utility Light with 18-Gauge Cord features a galvanized metal lamp shield with rubber tipped hands-free hook and 25-Feet cord. The SL-425 is rated for up to a 75-Watt incandescent bulb (not included) and has a durable push on/off switch. Bayco provides high quality, rugged designs that stand up to the rigors of professional use. That means performance, durability and reliability are never compromised.